“While the masters of old will always inspire, Designers may be the true intellectuals of the future” The Art of Winning Design was a decidedly different production concept for this prestigious automotive awards evening – saluting the inspiration and driving force behind the inspired minds and creative magic of award winning design and engineering, crafted by some of the industry’s finest – each of the finalists exhibited as true works of art in their own right but only one of which would drive away as the ultimate masterpiece for 2014. The entire production acknowledged the talents and minds that have, over centuries, taken a simple idea and as if by magic, turned this innovative thinking into inspired art and winning design. 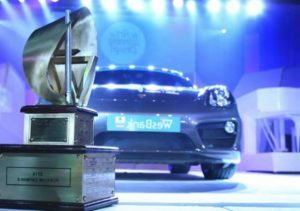 Prior to the dramatic reveal of the 2014 winner – with the Porsche Cayman S literally bursting through a White Grand Piano – the evening got off to a high-energy start that simply saw no stopping and guests were assured of having a seriously good time on the night with performances by Daniel Baron, Carly Graeme, the extraordinary talents and strength of Barbara Costas and John Beverage and the inimitable Katlego Maboe as our celebrity host for the evening.